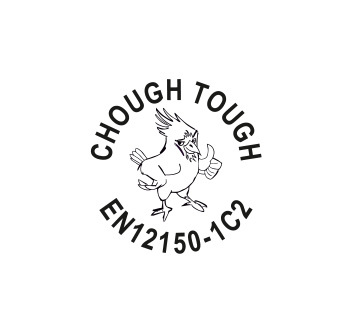 We produce our own branded Chough Tough™ toughened glass at out three toughening locations in Cornwall, Devon and Somerset. Toughened glass is a safety glass with increased strength both physically and thermally. Glass that has been toughened is 4 to 5 times stronger than non-toughened float or annealed glass. Toughened glass is produced by heating it in specialist toughening ovens before it is cooled in a control environment. It can withstand greater temperatures, impact and stress than untreated float glass. All of our standard toughened glass is stamped EN 12150-1C2 and our toughened glass units EN1279. We can toughen glass from 4mm up to 19mm thickness and have the capability to produce toughened glass up to 3,2000mm x 6,000mm. Toughened glass is used in a variety of installations such as doors, lower level windows glass, stairs or balcony balustrading, table tops or anywhere there is a risk of serious injury. Our state-of-the-art processing plants ensures all of our products are produced with maximum strength.